OTTAWA — The Ottawa Senators hardly had to deal with Ben Bishop at all in their former goalie’s first game at Canadian Tire Centre as a member of the Tampa Bay Lightning. Ottawa defensemen Marc Methot and Erik Karlsson scored first-period goals against two different Tampa Bay goalies in the Senators’ 5-3 win Thursday. Bishop, who is among the NHL leaders in wins (26), goals-against-average (2.01), save percentage (.932) and shutouts (four), did not return after leaving at 1:49 of the first period after he was injured on the play that led to Methot’s opening goal. The former Ottawa goalie came out of his net and dove headfirst to challenge Senators forward Mika Zibanejad in a race for the puck. Zibanejad came up with the puck, and Bishop was struck on the back of the head by Lightning forward Nikita Kucherov’s skate. “It came off the boards and I thought I might have had a chance at it, and I went for the pokecheck, and I think [Kucherov] tried to jump over me, and I picked my head up as he was jumping over me and I don’t know if it was his skate or knee or what,” Bishop said. Methot scored into a wide open net while Bishop lay on the ice. Anders Lindback replaced Bishop and allowed Karlsson’s goal with 24.7 seconds remaining in the opening period, second-period goals by Zack Smith and Kyle Turris, and Bobby Ryan‘s team-leading 20th goal at 6:55 of the third that put the Senators up 5-1. Tampa Bay coach Jon Cooper was relieved that Bishop’s injury does not appear to be as severe as first feared. “I felt a lot better after speaking with him after the first period,” Cooper said. Lightning forward Valtteri Filppula left the game with an apparent lower-body injury in the second period. He went down the tunnel 29 seconds into the middle period after a hit by Senators defenseman Eric Gryba. Filppula, who was selected to play for Finland at the 2014 Sochi Olympics, returned for one shift six-and-a-half minutes later, but skated off shaking his head and in apparent discomfort. “He came out and took a shift and then he couldn’t take it anymore, so he’ll be another one we’ll have to wait on,” Cooper said. Anderson made 35 saves for Ottawa, which returned from a 2-1-1 road trip for its only appearance at home in a stretch of eight games. “I thought we were a very good team for the (first) two periods,” Senators coach Paul MacLean said. “We got a 5-1 lead early in the third period, then I think we took our foot off the gas just a little bit, gave them some momentum with the shorthanded goal, but for the most part I thought as far as playing at home, the first and second period were the most consistent we’ve been in a long time. The Senators begin a three-game trip Saturday against the Toronto Maple Leafs. Alex Killorn scored his 13th goal at 3:10 of the second period on a pass from Kucherov to draw Tampa Bay to within 2-1. Smith restored the Senators’ two-goal advantage at 3-1 with his 10th goal, an unassisted effort at 6:25. Turris made it 4-1 with his 18th goal, his eighth in 10 games, at 18:40 before Ryan completed the Ottawa scoring nearly seven minutes into the third. Tyler Johnson made it 5-2 when he scored the Lightning’s fifth shorthanded goal of the season on a breakaway at 12:54 of the third. Tampa Bay captain Martin St. Louis got his 600th assist on defenseman Victor Hedman’s goal, his 11th, with 2:52 remaining in the third and Lindback pulled for an extra attacker. The Lightning lost their second in a row to begin a four-game road trip, including a 3-2 loss in Toronto on Tuesday that ended a three-game winning streak. Tampa Bay plays the Montreal Canadiens on Saturday. Methot, who finished the game plus-4, scored his fifth goal into a wide open net immediately after Bishop was injured to give Ottawa an early 1-0 lead. 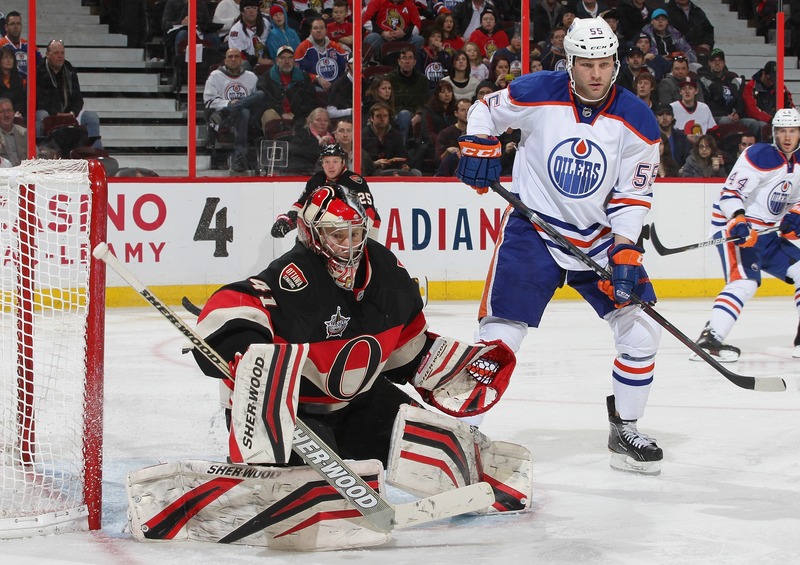 Bishop, who is 26-7-4 in 40 games, was making his first appearance in Ottawa since he was traded to Tampa Bay by the Senators on April 3, 2013, for Cory Conacher and a fourth-round draft pick. Spezza got his second straight assist when Karlsson scored from a sharp angle late in the first to make it 2-0.